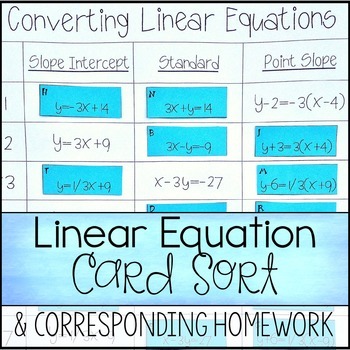 This card sort & homework is designed to strengthen students’ skills in converting between the 3 forms of linear equations: Slope Intercept, Standard, and Point Slope. 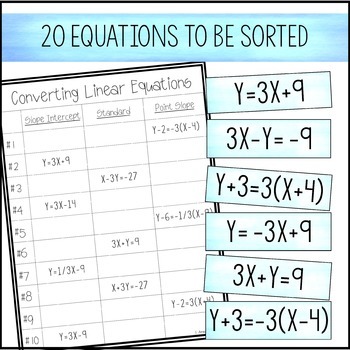 In the card sort students will cut out 20 equations and glue them to the corresponding place on the linear equation grid. The grid already has 10 equations on it for them to match their 20 cards to. When they have completed the activity they will have 10 equations of lines in all 3 forms for a total of 30 equations. 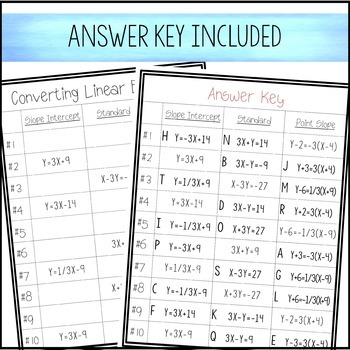 This activity is easy for the teacher to check while walking around the room due to each equation having an associated letter than goes with it. Answer key is included. Homework is also included with this card sort activity. Answer key is included. Both the card sort and homework are shown in the preview. Please view the preview if you are unsure that this is the correct product for your classroom. to receive a Free Pi-Rate Plotting Points picture.